This month on the Gender-Nutrition Idea Exchange we celebrate International Women's Day 2016. In this blog, originally published on IFPRI's website, Agnes Quisumbing, Senior Research Fellow at the Poverty, Health and Nutrition Division (PHND), IFPRI, talks about how data and evidence on women's empowerment inspired policymakers and program implementers in Bangladesh to launch an agriculture initiative which aims to empower women and improve nutrition. One of a researcher’s biggest fears is that research outputs go unread, gathering dust on people’s shelves before ending up in the recycling bin. However, this fear was unfounded for our work on the Women’s Empowerment in Agriculture Index (WEAI), which has gone from esoteric research tool to a widely-used data collection tool that has inspired a new generation of policies and programs for women’s empowerment in Bangladesh. Our long history of working in Bangladesh, coupled with an impressive record of policy engagement, made Bangladesh an ideal setting for asking the following research question: How does one really empower women in agriculture? Flashback to 2011, when our colleagues at USAID’s Bureau of Food Security asked us to work with the Oxford Poverty and Human Development Initiative (OPHI) to develop an index for measuring women’s empowerment in the US Government’s Feed the Future Initiative. We worked feverishly through the summer of 2011 to develop the survey instrument, which was then piloted in Bangladesh, Guatemala, and Uganda. Our colleagues in Bangladesh, Data Analysis and Technical Assistance, Ltd. (DATA), piloted the WEAI and explored innovative ways to make data collection more streamlined and efficient. A truly innovative feature of the index is that it relies on interviews of women and men within the same household, enabling us to compare how empowered women are relative to men within the same household. In 2012, IFPRI’s Policy Research Strategy and Support Program in Bangladesh launched the Bangladesh Integrated Household Survey (BIHS), which was the first nationally representative survey to include the WEAI. Our partners from DATA fielded this survey, and as we analyzed the data, a clearer picture of women’s disempowerment slowly emerged. 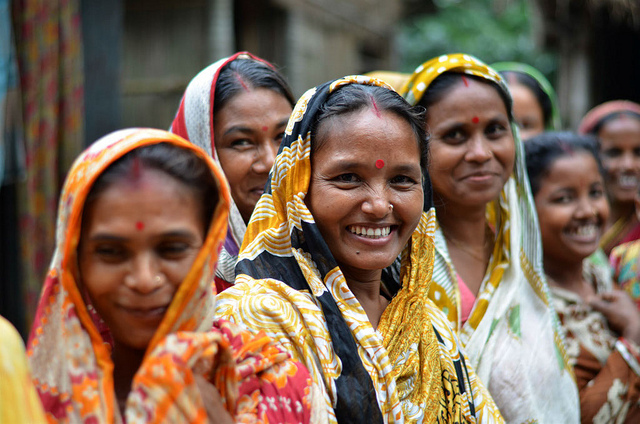 Seventy seven percent of rural women in Bangladesh are disempowered, compared to around 56 percent of men. Empowerment gaps for women are greatest in terms of leadership in the community and control and access to resources. For men, time poverty and lack of leadership within the community contribute most to disempowerment. Because the areas in which men and women are disempowered are quite different, different programs and policies are needed to empower both sexes. Moreover, analysis showed that women’s empowerment is significantly associated with child, maternal, and household level dietary diversity. This significant relationship between nutritional outcomes and women’s empowerment helps explain why two divisions, despite their high economic growth, had poor nutrition outcomes—these were the regions with greatest proportion of disempowered women. The striking extent of women’s disempowerment—more than three-quarters of rural women in Bangladesh, representing the highest percentage of disempowered women among 13 Feed the Future countries worldwide—prompted Bangladeshi policymakers into action. Working with IFPRI’s Dhaka-based PRSSP, the Ministry of Agriculture in Bangladesh is now piloting a new program called “Orienting Agriculture Toward Improved Nutrition and Women’s Empowerment,” which is better known by its nickname, ANGeL (Agriculture, Nutrition, and Gender Linkages). Working with its implementation partner, Helen Keller International (HKI), known for its homestead food production programs and approaches to community-level gender sensitization, the project focuses on reducing gender inequities at the household level to improve maternal, newborn, and child health and nutrition by providing trainings in agriculture and nutrition coupled with behavior change communication(BCC) to both men and women. Traditionally, nutrition trainings in Bangladesh have been limited to women while agricultural extension messages have been restricted to men. Community nutrition workers will use HKI’s tool for gender sensitization activities to deliver trainings on food security, nutrition, asset control and decision-making, mobility, and income management. This will be done in collaboration with government agricultural extension agents who deliver extension messages training to both men and women. Gender Sensitization: Undertaking gender sensitization activities that lead to greater levels of women’s empowerment and gender parity among women and men. The study will test the hypothesis that women’s access to agricultural extension services will empower them in terms of decision-making in farming and autonomy in agricultural production and marketing as well as autonomy in other nutrition-related spheres. The ANGeL baseline survey has just been completed, and as the Ministry of Agriculture and HKI implement this program over the next three years, IFPRI and its partners will be carefully collecting data, talking with men and women to find out how their lives have changed, analyzing the quantitative survey and qualitative data, and eagerly waiting to find out what really works best to empower women. The "Agriculture, Nutrition, and Gender Linkages" or ANGeL project is mapped to A4NH.